Situated a 2-minute drive from Oakmont Country Club, this 3.2 acre “Pad Ready” site, zoned R-3, is ready for high density residential development. 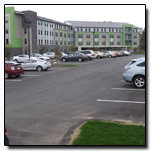 Red Swing Properties, LLC, owns this residual tract of land which abuts a brand new $9M LEED AP 58-unit senior independent living facility, named The Retirement Residence of Plum. 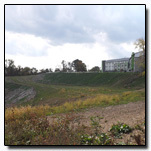 There are several residential development options available for this property. Retirement and senior living is in high demand in the Plum Borough community. The adjacent Retirement Residence of Plum facility was filled with a wait list created before construction was complete. Extending the senior housing concept to this next-door site would complement the adjacent community and provide a low risk opportunity. The Developer could adapt and utilize one of the apartment concept sketches described below. A need in Plum Borough is apartment style living. The lack of apartments, especially on the northern tier of Plum creates this void in the apartment marketplace. This style of development would complement the adjoining property toward the east which are condominium flats. 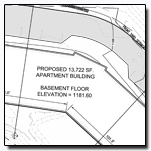 There are two (2) thumbnail links below of conceptual apartment plans. One is titled “Plum Heights Original Master Plan with Apartments” which depicts a 4-building, 36-unit mix of 2 and 3-bedroom apartments plus a clubhouse. This concept would have all street parking. The second one is titled “58 Apartments with Garage Parking Concept – Site & Floor Plans” which contain a couple of variations of either a 2-building, or 3-building concept, with a mix of 1 and 2-bedroom units. 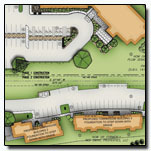 These would be a mix of street and garage parking, allowing each unit to have one covered space within the building. 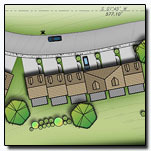 An additional need in Plum Borough is a townhome living concept. New townhome construction beyond a few small “4 or 6-packs” have not been built in Plum for nearly 3 decades, creating a large void in townhome housing. This style of development would fit well into the existing landscape as the adjoining property toward the east and south are townhouses. There are thumbnail links of two (2) different townhouse conceptual plans below. The first is a townhouse concept consisting of 23 units (24ft wide) having 3-bedrooms/3 ½ baths each with a 2-car garage. 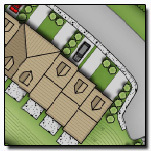 The second conceptual plan has 28 units total (18ft & 24ft wide) which consists of 22 units (18ft wide) having 3-bedrooms/3 ½ baths each with 2-car garages and 6 units (24ft wide) having 3-bedrooms/2 ½ baths each with 1-car garages. Red Swing prefers to sell the parcel, but will consider partnership opportunities as investment to increase the equity into a project’s financial proforma.